At Neutral Bay Laser & Dermatology Clinic, we are committed to using the latest science and medical technology to help you look your best. Hyaluronic acid filler, used to fill out deeper lines and grooves in the face, caused either by facial expressions or the shape of the face, including plumping out the lips. 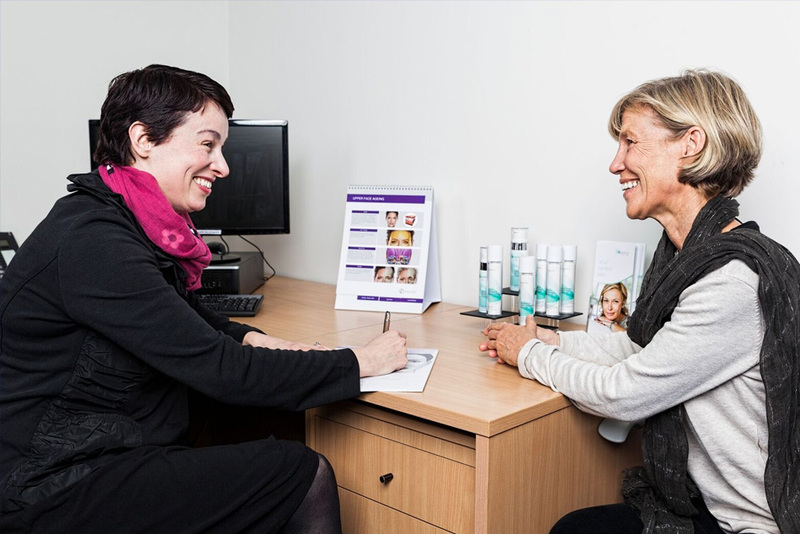 Patients wanting to know more about the use of injectables can make an appointment with Dr Marianne Nolan, or Snr RN Kim Murphy, who can talk you through all the benefits of injectables. What happens in an Anti-Wrinkle Injection treatment? When you come for treatment with the anti-wrinkle injections , we will discuss the treatment with you, explaining the risks, benefits and side effects. You will first be asked to sign a consent, showing your understanding of what we are going to do and what the potential risks are. You will then have your photograph taken to show the lines and wrinkles that we will be treating. These photos are taken so that we have some comparison once the treatment effect can be seen. Photographs will not be used for any purpose other than being held in your records, unless we have received specific consent from you for use in a specific purpose. You will then be seated in the treatment recliner. The injectable product is then prepared and the syringes are filled with the product. Once your skin is cleaned, the small injections take just a few seconds each. The entire duration of the treatment will depend on how many sites are being treated, but you can expect your treatment to last 10-15 minutes on average. What happens in a Filler treatment? There are two types of injectable products that we use to rejuvenate and improve patients’ skin. Muscle relaxants, known as the anti-wrinkle injections, are discussed above. The second type of injectable are called dermal fillers. The fillers that we use at Neutral Bay Laser & Dermatology Clinic help to replace the facial volume, which can be lost with age, as well as enhance certain facial features, such as increasing lip volume. Our fillers are made of hyaluronic acid, which is a substance that occurs naturally in a person’s skin and can bind 1000 times its own weight when in water. With age, our own hyaluronic acid volume decreases, causing volume loss in the face and creating an older appearance. Your treatment with fillers will begin with an assessment and consultation. Areas that can be treated with filler include cheeks, lateral face, corners of mouth, nasolabial lines, forehead, temples, the lip and surrounding areas, pre-jowl area and the chin crease. Once your treatment plan has been decided on, we usually apply anaesthetic cream to numb the area to be treated. The filler is then carefully placed under the skin. After your treatment, ice packs are applied to the area to minimise the risk of bruising and swelling. It is recommended to avoid heavy exercise and alcohol for the remainder of the day. Filler usually lasts between six months to two years, depending on the viscosity of the hyaluronic acid, the area into which it is injected and a person’s metabolism. If you’re interested in knowing more about how injectables might help you look your best, call our receptionists on (02) 9953 9522 and make an appointment today.